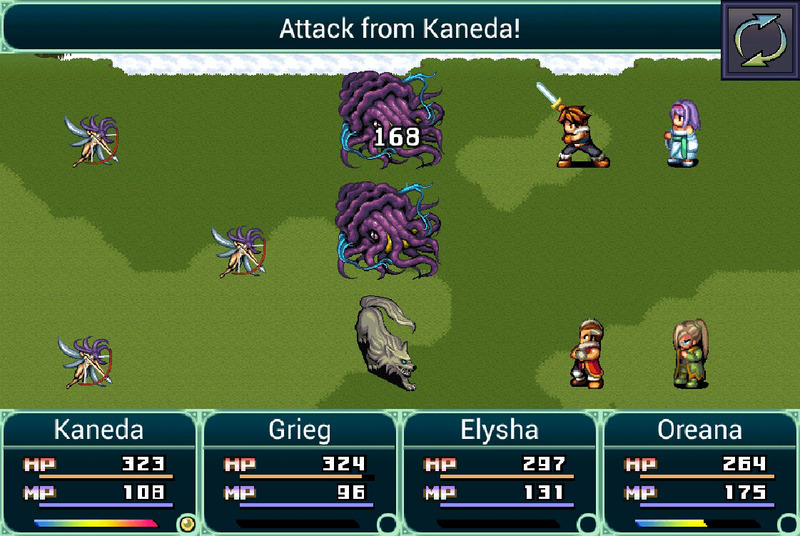 Grinsia is the latest game from indie game publisher NICALiS and a port of an RPG from the prolific mobile publisher Kemco and little-known Japanese mobile developer MAGITEC. I hadn’t played a Kemco game before now, so I was excited to see a product from a company that I’ve seen attached to many RPG projects on iOS and Android. Let’s dig into it. As you can tell from the screenshots. 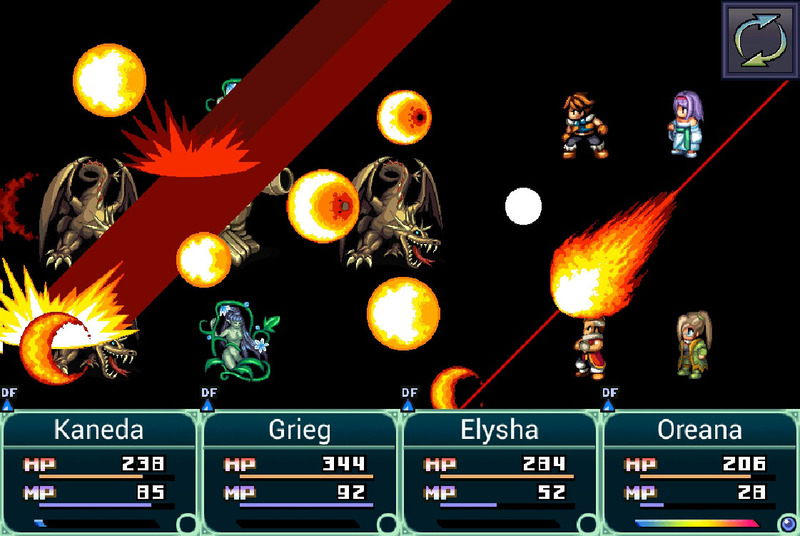 Grinsia is essentially a 16-bit RPG. It faithfully recaptures the look and sound of SNES-era games. And that’s not necessarily a bad thing, so long as the game has something unique to offer in other areas, like story or mechanics. After all, why should I invest time into an RPG that looks like Chrono Trigger or Final Fantasy when I can still go back and play those games? You start the game following a father-son-daughter team of treasure hunters. They’ve spent all their money to explore some ancient ruins, rumored to be a resting place for one of the elemental Relics that the creator goddesses left to care for the world. The Empire has laid claim to the site, though, so you’ll have to find a sneaky way in. Once inside, the band is approached by the goddess, who begs them to hunt for the six Relics to keep them out of the hands of the Empire, which will bring about the end of the world if it gets its hands on them. If that sounds a little bit familiar, it should. If you’ve been playing RPGs for any length of time, you’ve heard it before. Starting the game as a family was interesting to me, but there’s very little that separates them from the band of friends that permeates most RPGs. There’s some dialogue early on that made me think that maybe the Empire wouldn’t be blatantly evil. Maybe they’d even be a noble empire. Foolish hope, it seems, since it turns out this empire is as cartoonishly evil as every other RPG empire. There are some attempts at the end of the game to “redeem” the acts of the Empire, but, when its soldiers act like bullies a lot of the time, it comes off as a wasted effort. I guess it’s not horrible that the game follows genre clichés, but I was really hoping to see some kind of realistic family conflict or an empire not made up of cruel soldiers for once. So, it’s not that the story is bad per se. The characters are all fun in their brief bits of dialogue, and collecting the Relics (which provide passive stat bonuses and a unique spell when fully charged) is entertaining enough to pull the experience along. It’s just another excuse for a plucky band of adventurers to gather the six elemental MacGuffins to keep them out of the hands of the evil Emperor, which is a little disappointing. Of course, the Emperor gets them, and is betrayed by an even more powerful being later on. As in, the plot of Final Fantasy II (both of them). 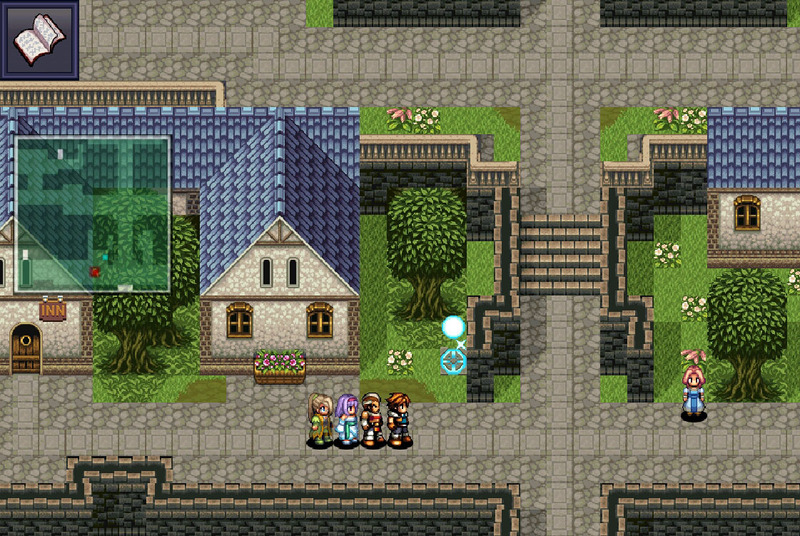 And that was fine 20 years ago, when storytelling in RPGs was still coming into its own. For a game of today, I was hoping for something more nuanced. So, right off the bat, I found the game disappointing, since story would be the main thing going for it. 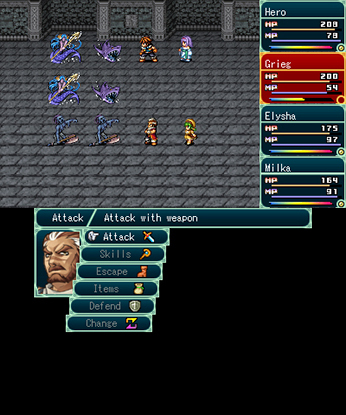 It almost feels unnecessary to say it, but the battle system is classic turn-based fare. Now, I like turn-based games. It’s a slower, more methodical style of play. It’s great for people who like their games to be puzzles, rather than tests of skill. Lots of games I love have turn-based gameplay. But Grinsia takes it in the wrong direction. You have no indication of who’s going to attack when, making it a guessing game (attack order changes from battle to battle). This is all the more aggravating given the game’s formation system. As you might expect, if an enemy is further away, you’ll do less physical damage (magic and ranged attacks are excluded from this rule, naturally). So, if there’s an enemy you really want to get rid of, it may be more of a hassle than it’s worth. It just makes battle random, rather than strategic. Of course, this is only really a problem in the last third or so of the game. For the first two-thirds, enemies will be pushovers. You’ll be able to select auto-attack, and just let the game play itself. During that time, I was able to beat bosses in under five turns. I know, because I had a regeneration spell that lasted five turns. In the early game, that spell didn’t run out before the battle did. I never had to go into town for healing before the boss; I still had almost full health and magic. Part of that was thanks to a ridiculous loot drop system. I had potions running out of my ears. I would think I was running low when I was down to forty potions. When I finally did run out of potions, I had sixty to eighty higher level potions ready to go. With loot dropping like that, I never once bought a consumable item. I got more than enough of them from enemies. However, in the last third, the game takes a big difficulty spike. After that, I was teleporting into town often for healing, even before the bosses. And those bosses gained the ability to give any number of random status effects to the entire party, which felt really unfair. The last third of the game is really grind-heavy. “Good” thing the encounter rate is so high. You’ll have fought so many battles by the time you get to the boss, you may have forgotten that you’ve only traveled one or two screens. Dungeons are really small in this game, though the folks at Kemco seem to be masters of finding the longest route possible to traverse them. Even the final dungeon only has about five screens. But you’ll go up and down through them so many times, you may not be able to keep track. Also, the game has some technical hiccups. More than once, I fell victim to game-breaking bugs as I played the game. For some unknown reason, the game would freeze when loading a new area. There was even a town I couldn’t access. In this state, I had no choice but to shut off my 3DS, and turn it back on again. While I could easily get around the town, it’s really disconcerting to know that a game-breaking bug could be right around the corner. None of these stopped me from completing the game, but they were pretty frustrating. Now, it isn’t all bad. The mobile mentality has helped the game in several ways. There’s a lot in there that’s really convenient. You can save the game anywhere. Teleportation is open right from the beginning, so, if you need to go back to a certain town, it isn’t a hassle to do so. Rather than having a save point before the boss, there’s a teleport point. You can go back to town, fully heal, then go right back to the boss. Your character can actually answer yes or no to certain dialogue choices, which can change the story slightly. Since there are six Relics and six party members, I also got to customize my party to my liking. 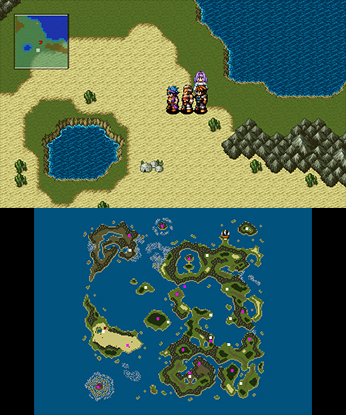 And, to be fair, Grinsia does perfectly capture the look and feel of SNES RPGs. The sprites are pleasantly detailed, and, while animations can be a bit stiff at times, it’s never enough to take you out of the experience. There are odd places where you think you should be able to walk, but can’t, but these are few and far between. There seems to be a shortage of stock enemy types, but there are enough that it isn’t too distracting. The music is pleasantly retro, if not terribly memorable. Really, these screenshots show exactly what the game is driving for, and they speak for themselves. All in all, Grinsia isn’t a bad game. It’s just not really a good one. It’s a passable effort, but I’d only suggest it if you a) have no backlog, b) love old school RPGs, c) don’t already have it on mobile, d) want something really simple to play for about 20 hours. 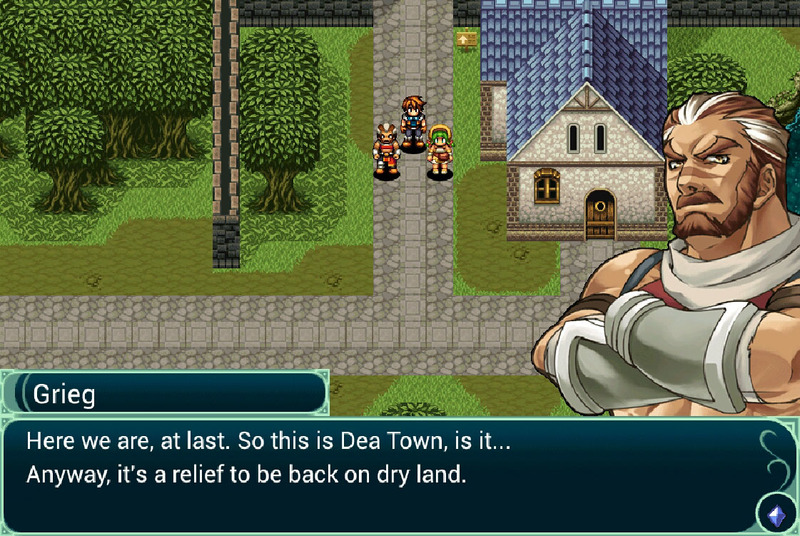 Kemco did a good job capturing the feel of a SNES RPG, and making it accessible for the mobile market. The problem is that they didn’t go beyond that. And, on mobile, that might be enough. When your competition is Final Fantasy All the Bravest, being OK might seem almost revolutionary by comparison. On the 3DS, though, it’s running up against Bravely Default, Etrian Odyssey, Shin Megami Tensei IV, even the small, but excellent Denpa Men. For $9.99, Grinsia doesn’t really bring anything to the table to make it a worthwhile 3DS purchase for most people. 3DS review copy provided by publisher.